A story of two lots. 1854 John Hang sells to Vincent Magendie two houses occupied by Chinese. 1856 August - acquired by Julius Hoerchner, he divided the lot into 2 lots. 1856 November - a one story brick building was on the southern part. 1858 Lager Beer Saloon in the building. 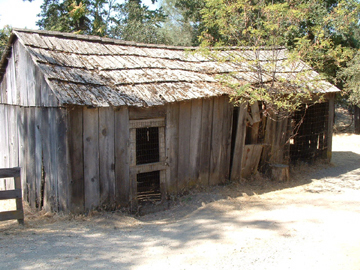 1859 A. Abrahams Co. grocery store. 1861 Store for sale. Hoerchner sells to Louis Lippmann who runs a fruit and vegetable stand. 1862 Louis Lippmann sells to Michael Lippmann. 1866 Michael Lippmann sells to William Nauman. 1868 April - Nauman sells to Wm Shine. 1871 John Lane "Pegleg" ( aka Rebstock) is shot. He ran a little store in the back room selling peanuts, candy, and had a small bar, he also lived there. 1875 Town trustees grant title to Ah Chee(?). 1876 Assessed to Ah Chee Company. 1876 October - Ah Chee sells to Fred Zwickert. 1880 Zwickert sells to Schwartz. 1857 Add brick building to lot. Sells to Henry Weyland. 1859 Anton Seibert, Bakery and Coffee saloon. 1864 Seibert buys the building. 1865 Building lost in the fire, not repaired. 1868 Seibert sells lot for $25 to Wm Shine. Shine removes debris and mines the lot. 1880 Fred Zwickert sells to Ludwig Schwartz. 1919 F. A. Wenzel owns the lot. 1919 November - Fred Van Reed buys the lot. 1930s Carlo Franco builds the barn. 1947 State purchases the lot, Franco lives in the cabin next door until he dies in 1959.